Talk about a serendipity salad! 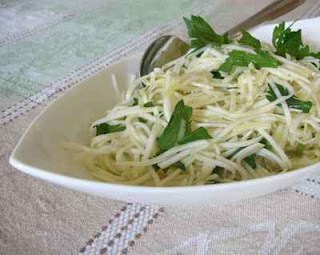 This simple salad made from raw celeriac is delicious! At Soulard Market, the local offerings are slim at the moment, thanks to four days of very hard-freeze in April. To make their trips worthwhile, Soulard's real farmers are adding imported produce to their own limited supplies (unlike the Market's many produce vendors who sell only outside produce year-round). Kruse Gardens is one of my favorite stops at Soulard, a regular source of organic, locally grown and unusual vegetables in St. Louis. I really enjoy Earl and Arlene (whose 50th wedding anniversary I was happy to share last year!) and son Steve, who for 13 years has greeted me with a big smile. And I'm struck by how different the Kruse's add-ons are different from the produce vendors' regular fare. Take big knobs of celeriac. (Yes, you'll want to! Grab one now!) They're fat and plump and alive-looking, despite their rough, knobby exterior -- compared to the celeriac at the grocery that always seem dry and shriveled and entirely unappetizing. So I picked one up, not sure what to do with it. By the time supper arrived, I had about 15 minutes to spare so decided to pull out the benriner . Amazing -- a celeriac slaw! And sooo simple. Just the celeriac, lime juice and/or good vinegar, a little oil, sugar, salt and pepper. I can see why people like 'raw' food. FROM THE ARCHIVES See the Recipe Box for other recipes and ideas for what to do with celeriac. There's only one recipe at the moment, but given this slaw, there will soon be more! TWO YEARS AGO Asparagus Jam ... "good along roast pork or some other rich meat where the sweetness would contrast richness", from Chocolate & Zucchini! Slice off the exterior of the celeriac (just use a knife, it's too big a job for a vegetable peeler). Use the benriner to cut thin-thin-thin ribbons. (If you want to use a knife for this, slice off the thinnest bit you can manage and taste it. If it's small enough to be edible, raw, than carry on. But if it's not, you might want to cook the celeriac before proceeding.) Add the remaining ingredients. Serve immediately. Looks amazing! And I thought my celeriac salad (celeriac, mayo, parsley, salt & pepper) was simple - yours even better!! I'm intrigued! I've always waltzed right by the celeriac, not really knowing what one did with it. This is a great blog. I found you via google, when I was trying to find out something, and it occurs to me you might know the answer: do you know of a program in St Louis that does weekly or biweekly vegetable boxes? Not necessarily a CSA, though that might be workable as well, but something like the Good Food Box? Gad, how simply awesome! Why didn't I think of that? Well, because. This is really good -- I threw some julienned apple in there too, and some parsley leaves.